Any kid whose mom holds the key to killer chocolate sauce is darn lucky--for the rest of us, there's Somebody's Mother's. Stirred up by Lynn Lasher, Dallas based super mom and chocolate sauce savant. Lynn's wholesome heirloom recipe is absolutely heavenly drizzled over a scoop of vanilla ice cream and designed for sneaky spoons. 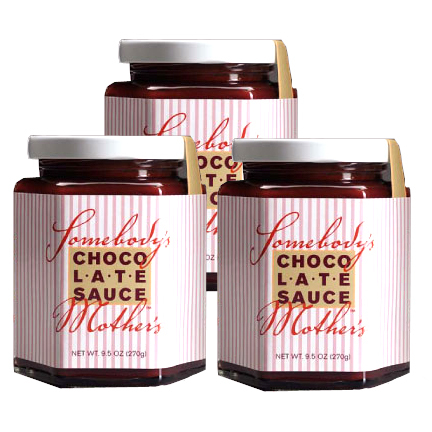 The packaging is tasteful, no nonsense, and sweet--the stuff good moms are made of. The set of three is the perfect gift to kiss away lifes boo boos or those pesky holiday blues. Chocolate sauce is great poured over anything. That's all I have to say about that.